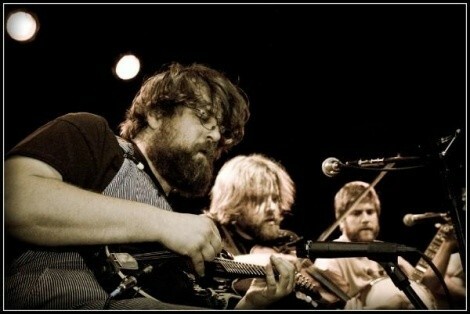 Minnesota's Trampled By Turtles sure play fast for sittin’ down. Tramped By Turtles is not a bluegrass band. The string quintet out of Duluth, Minn. might draw on fiddle, mandolin, banjo, acoustic guitar and bass to crank out high-energy jams, but as frontman Dave Simonett observes, the definition of bluegrass is too narrow for its own good. The term’s narrow scope is partly why the Midwestern musicians settled on their name. “We wanted anything that wasn’t bluegrassy in nature, like a name with mountain, river or ‘the something, something boys.’ We have never called ourselves a bluegrass band,” he says by phone from the road. Formed in 2004, Trampled By Turtles takes its cues from folk, country and Americana greats Townes Van Zant, Dylan, and Wilco, but many fans are surprised to hear genres strains of punk rock, heavy metal, gangster-rap in their sound. Progressive for stringed-music, Trampled brings that raw, rip-roarin' energy to their shows, playing like they’re plugged-in. When I first saw Trampled in concert, I heard someone say, "Hot-diggity-dog, those boys sure play fast for sittin' down like that,” to which Simonett says, "We have tried to play acoustic standing up, but it was really tough. Believe it or not, it is easier to play fast while sitting." The image of the band lined-up on five chairs made its way onto t-shirts and propaganda after a fan-based design competition earlier this year. Aside from the ferocious fiddlery and high-intensity strumming, Trampled receives little credit for their way with ballads. Songs like "Empire" or "Trouble" strike a chord of legendary proportions. Simonett describes the perfect slow jam as "any Hank Williams song. Take your pick. When loss and heartbreak are easily conveyed, it creates a magical music experience-that's what a ballad is supposed to do." Every tour has its trials and tribulations. The loss and heartbreak on this tour was Dave Carroll's banjo being stolen in Mankato, MN. But, there was a happy ending: "The guitar store called and said they had it. Some kids sold it for $300, and this was a $5000 banjo. Eventually they were busted by the cops. We have mixed feelings. While glad to get it back, we don't want the kids to go to jail, they are only eighteen," says Simonett. Maybe this story will turn into a ballad. Taking time from a busy winter schedule, Trampled, as first-time producers, are in and out of several studios to record Palomino, to be released April 13. Different from previous albums, the band is learning the tunes in the studio, instead of honing them on the road. Except for several vocal harmonies, the songs are mostly recorded live, which captures the essence of the band's opulence. After this tour, fans can expect several off-chutes. Dave Simonett has almost finished recording an EP with Dead Man Winter, a straight-up rock band. Dave Carroll will continue to play with Too Many Banjos, while mandolin player Erik Berry will perform solo, including a recently released Christmas album. When asked, despite his musical influences, Dave is emphatically against recording a gangster rap album. "Not because of desire, but a lack of talent." Smaller shows are often their favorites because of the intimate relationship with the crowd. You can expect some vivacious string music, while enjoying vast depth and quality in song writing. Thus far, they haven't worked any Christmas jingles into their repertoire, but concertgoers might bear witness to John Prine's "Christmas in Prison," says Dave. My request: a stripped-down version of "Soulful Christmas" from James Brown's Funky Christmas. Simonett just laughed. Well then, do Christmas miracles really come true?